If you are an enterprise that provides products or services to consumers, these GeoWize site selection packages will enable you to locate the perfect retail site. 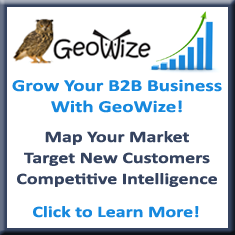 Locate your business with GeoWize! Please note, the images on this page link to an example GeoWize Targeted Site Selection Package. During our Live Data Review Consultation, we will guide you through understanding all of the information and applying it to your business growth strategies. Know your customers, know your trade area, know your competition. What is the ideal household income of your prospective customer? We can help you find out where these customers live? Entrepreneurs starting up a new business have a need to get some foundational information on prospective sites. Often times, the real-world trade areas are not known for lack of historical data. 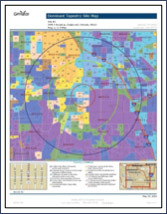 Experience has revealed that a good site selection starting place for defining trade areas is by defining three rings of 1, 3, & 5 miles around a target site. Custom Trade Area Profiles are available. Do you need a 1 hour drive time map? Would you like to see how far out you have to go to hit 100,000 people, households, women, kids, money spent on recreation, etc.? 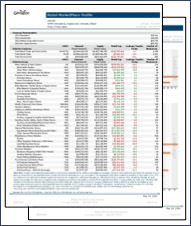 We can generate custom reports based on 1500 data attributes. Call us to learn how 303-731-1416. 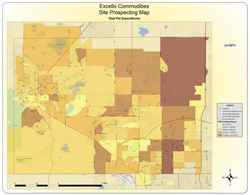 The Dominant Tapestry Segment Map is based on ESRI’s Tapestry Segmentation and displays the primary market segment for a specified area. Tapestry Segmentation classifies U.S. residential neighborhoods into 65 distinctive market segments based on demographic and socioeconomic characteristics. The dominant segments are represented on the map by segment number. Geography is color-coded by one of Tapestry’s 12 LifeMode Summary Groups that are based on lifestyle and lifestage. 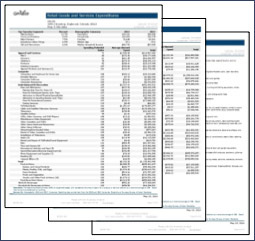 This report shows the total dollar amount and average amount per household spent on retail goods and services categorized by apparel, computer, food, finance, health, and insurance. A spending potential index (SPI) compares the amount spent far a product: or service in your area to the U.S. average. Retailers can quickly identify and compare national and local customer preferences. These preferences are critical to the site selection process. Understand the scope of retail activity in your market area. The Retail MarketPIace Profile displays the retail sales and retail potential dollar amounts; the leakage/surplus factor, which measures the gap between supply and demand; and the number of businesses by industry. Use the data in this report to evaluate the potential of future sites, determine if customers are traveling outside the area to shop, and plan marketing/advertising campaigns. Businesses that successfully understand and respond to growing consumer demands must know where to find area demand for their products and services. The Retail MarketPIace database, designed to help retailers analyze retail sales generated in a given area, shows if customers are traveling outside the area to shop and highlights retail sectors that represent the area’s biggest demand. Capitalizing on this information, retailers can make smarter decisions about site selection, product offerings, and more. “Keep your friends close, but keep your enemies closer”; understanding the competitive landscape is critical to small business success. The Competitive Analysis Map shows you where your competitors are located, provides a key for quickly relating the symbol on the map to the intelligence information on your competitors. Different categories of competitors can even be symbolized differently for quick recognition. The competitor list provides name, location, industry codes, estimated annual sales, & the number of employees. Deeper intelligence is available on each of these competitors for an additional fee. Ask us for a quote. Many restaurants and delis also provide catering services. Knowing where office buildings and other organizations that use catering services is important for their marketing and sales efforts. One of our retail tire customers found that if they located their store by a big-box home improvement store, then their store would be successful even if the site demographics were not optimum. The customer’s “destination” would be the big-box store, but while shopping they would drop their car off for servicing. The Feeder Business Analysis Map shows you where your feeder businesses are located, provides a key for quickly relating the symbol on the map to the intelligence information on your feeder businesses. Different categories of businesses can even be symbolized differently for quick recognition. Where do I start to look for my prospective business site? Most business owners start by going to a commercial realtor. A commercial realtor has an inventory of listed properties, and their objective is to put you into one of them. 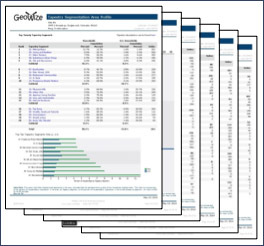 The GeoWize objective is to help you find THE BEST LOCATION for your business. 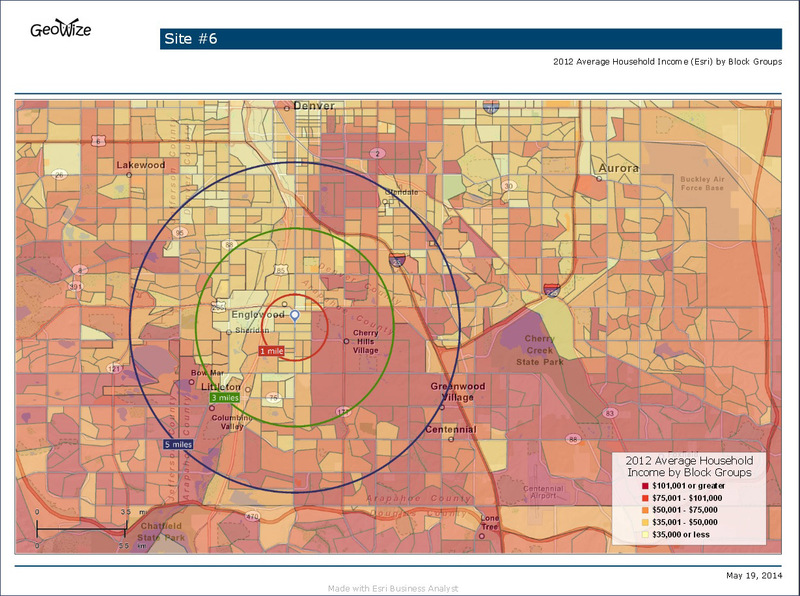 With the Market Site Prospect Identification Analysis, first we identify the critical demographics, expenditure categories, & profiles; then we provide you with two large-format maps of the entire study area that display your target metrics at the census block level, so you can quickly visualize good target areas to start looking for available real estate. You’ve thoroughly examined the large format maps from the Market Site Prospect Identification Analysis, and you have identified a number of specific properties working with your commercial realtor. After visiting each property to verify that they meet your physical site needs (ample floor space, parking, esthetics, etc. ), you want to find out which site has the best demographics, expenditure, and profile makeup. The Target Site Prospecting Analysis provides you with color-coded maps and reports to support your unique decision process, and to help you find THE BEST LOCATION for your business. How can we help you with your location or site selection needs?